Long Ears! Kid & Dog Friendly! Athletic! Musical Voice! Unique! An American Original! (1) Touchstone traits of a hound make them great pets. They are sweet, sensitive companions similar to many of the other popular hunting breeds like retrievers and pointers. 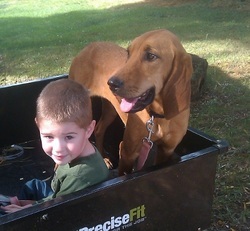 Coonhounds are guaranteed to make you laugh with their silly personalities and sense of humor. (2) They are an American original. Born, bred and developed in the USA! (3) Most are not aggressive seekers of attention so a gentle hand on their backs or a stroke to their soft ears quickly leads to melting contentment. (4) Grooming doesn’t get much easier! A quick swipe over their short, slick coats, nail trim and ear clean will put the polish to a hound. (5) Most hounds over two years old have a great on/off switch. Full of energy and ready to rock when a job is at hand, then content to laze on the porch or dog bed for hours when it's quiet time. (6) Coonhounds rarely “borrow trouble”. While they are far from innocent if an opportunity presents itself, they won’t invent or create problems. (7) Bred and selected to be workers, they have few congenital issues or problems that show up in dogs bred for a particular “look”. (8) Kid-friendly and dog-friendly! Many hounds were bred to hunt in packs, so they have great social skills for the dog park or in your home. (9) Soulful brown eyes to drown in and long silky ears to adore. (10) Stripes and speckles, spots and solids, reds, blues, tan, black, white, colors galore! (1) You can’t think outside the box. 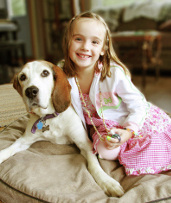 It takes a kind hand and creative approach to train a coonhound. (2) You aren’t prepared to take care of their needs for a warm resting spot in cold, northern climes. That smooth, short coat won’t offer much protection when snow and bitter winds come rolling in. (3) You aren’t ready to ensure that your confinement is adequate. While some hounds will laze on the porch all day and obey your commands on an off-leash hike, many will run through invisible fences if there’s game to chase or show off their skills as excellent fence climbers and jumpers. (4) Your neighbors like to hear a pin drop. Coonhounds were bred to announce the finding of game in a loud, musical voice ranging from a soft "woo woo woo" to a loud, blaring operatic aria. Hound song can be one of the most beautiful sounds you’ll ever enjoy in life, but it can lead to neighborhood discord unless you’re prepared to teach your hound when and where its appropriate to sing. (5) Coonhounds are large, athletic dogs that need to go to charm school and need a place and time to stretch their legs. They won’t laze happily at your side without a bit of training and without a chance to exercise.